Move Over, Millennial Pink. Melodramatic Purple is Here. Millennial pink has had its day. The warm shade shaped a number of decor trends in 2017. 2017 is over, though, and the new year is bringing hot new hues. One of the hottest is actually a cool, calming color. If you haven’t already been exposed to melodramatic purple, let us introduce you. This color started its climb to the top just recently. The name “melodramatic purple” came into the spotlight in August of last year, when Lorde stepped onto the red carpet in a dress of this color. Now, it’s cropping up as a go-to shade for fashionistas and interior decorators. Why? Melodramatic purple replaces the youthful vibes of millennial pink with sophistication and subtlety. While the pink was ideal for accent pieces and pops of color, this chic purple stands in for neutrals and shines when featured in major design pieces. Let’s take a look at a few ways you can incorporate melodramatic purple into your home decor. Decorating your outdoor spaces can be challenging. You want them to feel fun and fresh, but you also need to consider colors that can hold up when exposed to the elements. Fortunately, this year’s favorite purple can come to the rescue. Because melodramatic purple is already a soft hue, it doesn’t change much as it fades in the sun. It’s an ideal color for any outdoor upholstery and umbrellas. Or, if you’re looking for a more natural way to incorporate this trending shade, grow it. Lavender bushes thrive with infrequent watering, making them ideal for black thumbs and water-conscious gardeners alike. Mexican sage is another low-maintenance way to add splashes of purple to your yard. If you’re attracted to melodramatic purple but don’t want to be married to it forever, turn to your curtains. The changing season is a great time to swap out your window coverings and refresh your home. Add purple curtains to your dining room to give the space a luxurious feel. Remember, purple is the color of royalty. The soft touch of this drapery swap will make your space feel lush and inviting, even as it adds an air of sophistication. This curtain swap is also ideal for rooms where you want to add a sense of calm, like a nursery or office. If you’re feeling frazzled sitting at your desk, this soothing hue can help you recenter. Even if you find an affordable piece of furniture, there’s still the time-investment factor. There are many choices to consider: shape, size and fabric. Statement couches in vibrant hues are fun and add a notable design element, but will you get sick of the color? Melodramatic purple provides a happy middle ground between the same-old neutrals and high-saturation hues that could go out of style. The mellow but interesting color adds a cosmopolitan touch to any living area without overwhelming the space. 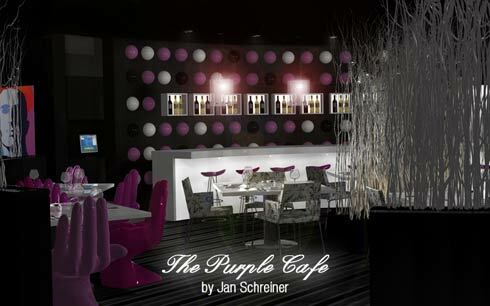 Melodramatic purple is making its mark on the design and fashion world. When you incorporate it into your home, you’ll not only be on-trend, you’ll also work an interesting but balanced shade with staying power into your decor. How will you use melodramatic purple in your home? Let us know in the comments.